Pulling some strings to get behind Conservatoire’s bar! 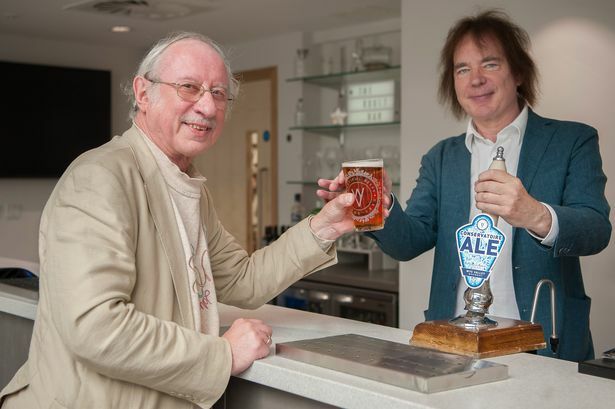 Music critic goes into a bar, and the bloke who pops up on the other side is none other than a world-famous cellist, who says “let me pull you a pint”. The critic in question is me, mine genial host is Julian Lloyd Webber, principal of Birmingham Conservatoire, and the beer is Conservatoire Ale, produced by Wye Valley Brewery in Hereford, and available only in this particular bar, situated in the welcoming foyer of the Conservatoire’s brilliant new building at the heart of Birmingham city centre’s learning quarter, Eastside of Moor Street Station. There is another dedicated Wye Valley brew, a bottled “Principal’s Ale”, its label bearing Julian’s signature -- and rightly so, as he had a palate in the tasting process - and again, only available at Birmingham Conservatoire, whose opening last week these beers were created to celebrate. Birmingham City University has had the vision to invest £57million from its own coffers (no public subsidy) into the building of a state-of-the-art home for its music faculty which is Birmingham Conservatoire, and the result is stunning, even from the impact made by its exterior on Jennens Road, striking and welcoming at the same time. When I made my way down the staircase into its welcoming cafe-bar foyer (and the food under preparation smelt really good), I was struck by the airiness and friendliness of the place. The previous Paradise Place home of the Conservatoire, a prime-located venue which lasted only 40 years before city centre redevelopment necessitated its destruction, had been dedicated and efficient, but in retrospect claustrophobic. Here on Eastside we have a building which is airy, bright, and with decor which is both softening and enveloping. And this is a home which students and staff richly deserve, not least those who have endured the past two years living in the rubble of a building-site, with the most uncongenial of access to the riches which were being presented within those doomed walls, whether educationally or in terms of public performance. The various performance spaces within this marvellous new Conservatoire building offer opportunities for all kinds of music-making within a venue tailored to suit. After the opening speeches and acknowledgements last Thursday we were invited to make our own tour of the building. My first port of call was the Eastside Jazz Club - the first permanent dedicated jazz space in any UK Conservatoire, and where there will be nightly performances - with a quintet playing coolly in this 80-seat cabaret-style venue which lacked at that moment only an audience toying with its glasses, and, as someone observed to me later, clouds of cigarette-smoke filling the atmosphere (no hope of the latter, my friend). Apart from the hardworking harpist gently tinkling an accompaniment to the opening skirmishes these were the first notes I heard played live within this inspiring new building. The next were to come in the amazing 500-seater concert-hall, with considerate sightlines and an acoustic flexibility thanks to adjustable canopies in the ceiling and lowerable blinds against the walls. And the notes in question were Bach’s Prelude in C major, played on a well-set-up piano by one of the architects from Feilden Clegg Bradley Studios, responsible for designing this miracle of purpose-built music colleges - possibly the last we’ll ever see built in this country, according to Julian Lloyd Webber, who must be sad at future prospects for music education as well as gratified that his own conservatoire has achieved such iconic status. There is also a 146-seat Recital Hall, a 100-seat Organ Studio (still, regrettably instrumentless, but generous private contributions are inching forward the meeting of the costs), and a state-of-the-art black box electronics studio which can be turned round through 180 degrees (no, I don’t understand that either). Concerts manager Emily Bartlett left our mouths watering when she teased us through what was to follow in the next year. Soon we are to hear lunchtime, commuter and full evening concerts here, but in the Spring of 2018 we will see the launch of the Conservatoire’s year-long official opening festival. CBSO music director Mirga Grazinyte-Tyla will conduct the Birmingham Conservatoire Symphony Orchestra in a gala concert before the three strands of the festival spread their tendrils: young artists, Birmingham connections, and world-leading household names. And as we left this splendid building we were all clutching our goodie-bags, including a bottle of the Principal’s Ale. Emblazoned on the carriers was the legend “Birmingham Conservatoire, the Conservatoire of the Future”. No-one is going to argue with that.